A Home Built on Silk: Lambert Castle ~ The History Girl! 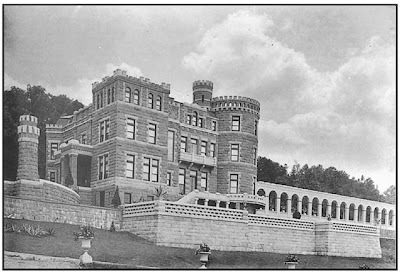 High above Paterson, New Jersey on Garrett Mountain, rises a castle composed of pink sandstone. For over 100 years, this castle, built by silk magnate Catholina Lambert, has watched over the industrial city, offering its owner uncompromising views. Built by the wealth of the silk industry, the property's downfall also rests in its connection to silk. While over its history, the property and castle has undergone changes, it will always remain a reminder of a burgeoning industry that once made Paterson an industrial powerhouse in the late nineteenth and early twentieth centuries. Lambert Castle was built by Catholina Lambert. Lambert was born in the village of Goose Eye, England in 1834. He was the oldest son of cotton mill laborers. In the 1830s and 1840s, his parents worked in cotton mills throughout the country, moving often to find work. The days working in the mills were long and hard and the pay was minuscule. Catholina did manage to receive an education until the age of ten, which was more schooling than most working-class children in England. By 1844, he began his first job working in the mills. He found employment at the Boars Head Cotton Mill, where the owner realized his potential and trained him for millwork. In 1851, at age seventeen, he completed a seven year apprenticeship. When he was seventeen, Lambert had heard about the opportunities in America and the increased possibility of becoming successful. It was then that he decided to come to America with his twelve year old brother William and their savings of five pounds. They left Liverpool, England on a boat headed to New York City. Once in America, Lambert began working for Benjamin Tilt and Walter Dexter, silk manufacturers with locations in Boston and New York. Benjamin Tilt left the partnership several years later and Walter Dexter offered Lambert a partnership in his company and a loan of $5,000. Lambert accepted his offer and within three years repaid the loan. After repaying the loan, he bought Dexter's share of the business. As part of the deal, one stipulation cited that the name of the company retain Dexter's name in perpetuity. Lambert's company rapidly expanded and in the 1860s, a three-story mill was built in Paterson. It was known as the Dexter Mill and during the Civil War produced products for the government. Lambert married Isabella Eldridge Shattuck in 1857 and they had eight children. Historians are unable to pinpoint exactly when the Lamberts moved to Paterson. In the 1860s they purchased "Maplewood," the south Paterson estate of James Close. Lambert's silk mills and production continued to expand and by 1890, he had become one of the largest mill owners in Paterson, the Silk City of the New World. As the years progressed, Lambert served in a number of capacities for organizations and clubs in northern New Jersey and New York. 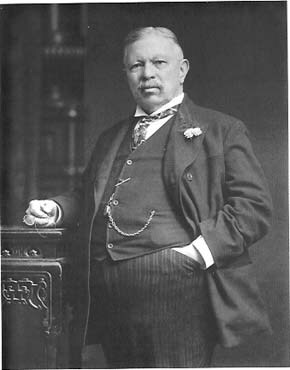 He served as president of the Merchants Loan and Trust Co. of Paterson; a director of the Ninth National Bank of New York City; president of the Silk Association of America and one of its organizers; a member of the Union League, the Lotus and the Republican Clubs of New York City, of the Hamilton Club, Paterson, and of the Board of Trade. He was a member of the Presbyterian Church and a generous supporter of all charitable works. Lambert held a fond appreciation for the arts and culture. Through the years he acquired an extensive antique and art collection and a comprehensive library of sacred music. By 1892, his home at "Maplewood" was no longer large enough to house his vast collections. That same year, he began constructing a new home in Paterson on Garrett Mountain, called "Belle Vista." Construction was completed by 1893 and four hundred guests were invited to a grand reception was held on January 31, 1893. Today, "Belle Vista" is referred to as Lambert Castle and was constructed in the style of an English castle, reminiscent of the castles Lambert saw during his time in England. The exterior is composed of a finely cut pink-tinted sandstone from local quarries and granite. It is estimated that the house cost at least $500,000 to construct. The floorplan was developed by Lambert himself with some assistance from John C. Ryle, a member of another prestigious silk family in Paterson. Upon entering the front doors, guests walk directly into a reception hall, complete with fireplace. To the left is the formal dining room, complete with a dining room set which is original to the home. Continuing through the reception hall, a staircase ascends to the second floor galleries and the hallway opens into a grand atrium, three stories tall. The atrium was originally designed to showcase Lambert's extensive art collection, which included works by notable artists such as Gainsborough, Constable, Turner, Rembrandt, Pissano, Monet, Courbet, and Renoir. Today, only four of Lambert's original paintings remain on the property. In the center of the atrium is the Cornu Clock made in France circa 1867. It stands almost eleven feet tall and weighs over 3,000 pounds. The clock is number 18 in a series of 36 and is thought to be the largest and most elaborate of the series. Adjacent to the atrium is a music room, drawing room, and breakfast room. The second floor contained bedrooms, guest chambers, and a gem room. The third floor contained bedrooms and additional storage and gallery space. "The wood work on all the rooms is of the finest oak. From the centre of the ceiling in the dining room hangs a French bronze chandelier, beautiful in design. The room was supplied with furniture of Italian design of the sixteenth century and some of the pieces were the finest hand carved work in this country. A "King Lung Empire" vase of 1732 stood near the door and a Hawthorne vase, said to have been the third finest in this country, was conspicuous." Lambert's extensive art and sculpture collections outgrew their space in the original castle and in 1896, he expanded it by building an art gallery, measuring approximately 150 foot long and 35 feet wide. At this time he also built a seventy foot observation tower at the crest of the cliff and a summerhouse. In 1900, he started opening the castle and art collection for public viewing every Saturday afternoon. Lambert Castle with art gallery addition, 1896. In 1898, President McKinley and vice president Garret Hobart visited Lambert and his family. Hobart was a Paterson native. Things had been going well for Lambert. His art collection was continually growing, his mills were producing highly-sought after silk products, and he was well-regarded throughout the region as being a fair businessman and employer. However, beginning in 1900, Paterson suffered a number of disasters. A destructive fire on February 9 and 10, 1902 destroyed 459 buildings, more than a quarter of the city's structures, and 26 city blocks. Just weeks after the fire, a flood devastated the city, wiping out much of what was left. In 1903, a similar flood inundated the city, destroying seven Paterson bridges, heavily damaging two others and left much of the city underwater. The string of disasters culminated on July 22, 1903, when a tornado tore a path of destruction through the South Paterson and Sandy Hill area. At approximately 3:00 pm, the tornado was first spotted on the Lambert property opposite the Castle, at "Maplewood." The house was occupied by several people attending the funeral of the former Ann Carpenter, wife of Walter S. Lambert and daughter-in-law of Catholina. Several trees on the property were uprooted, but there was little other damage. The tornado continued to make its way into the city, destroying homes and businesses along its route. At Lambert's Mill, panic struck the employees in the south section of the building as they saw the roof of the steel works torn off. The tornado left three dead, hundreds injured, and thousands of dollars in property damage. Tragedy also struck Lambert's family during this time. In 1901, Isabella Lambert, Catholina’s wife of forty-four years, died. In 1913, the Paterson silk strikes began as employees demanded more rights and improved working conditions. Shortly after the strikes, World War I had developed, which had a severe impact on the silk industry. There was a shortage of capital for loans. During this time, Lambert lost a large part of his wealth and was forced to mortgage his estate in 1914. In 1916, he sold a large portion of his collection of artwork. He auctioned off 368 paintings and 32 sculptures. He sold one of his silk factories in Paterson. By 1917, he and his son Walter began liquidating the assets of their company, Dextor, Lambert and Company. 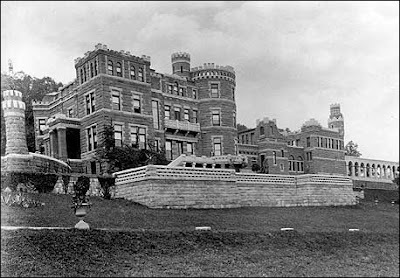 Lambert continued to live in the Castle until his death on February 15, 1923, at the age of eighty-nine. He is buried next to his wife, Isabella, in the Cedar Lawn Cemetery in Paterson. Lambert's son, Walter, sold the Castle to the City of Paterson in 1925 for $125,000. The city used the building as a Tuberculosis Hospital for several years and a fresh air camp for disadvantaged children. In 1928, the property was transferred to the Passaic County Park Commission as part of the 575 acre Garret Mountain Reservation. In 1934, the Passaic County Historical Society was granted permission to establish a museum and library in the building. In 1936, the Park Commission was forced to demolish Lambert's gallery that had been constructed in 1896 due to deteriorating conditions. The Castle was listed on the New Jersey and National Registers of Historical Places in 1976. In 1995, the Castle underwent a $5 million dollar restoration project, upgrading systems and allowing barrier-free access to the building. The castle exhibits furnishings of the time period in several rooms, has a large number of statues and artwork on display in the atrium, and is home to rotating exhibits throughout the year. When you are in the Paterson area, discover the home and luxuries of a wealthy silk mill owner during the last few years of the Gilded Age. Thank you for your research and review of this SPECTACULAR RESIDENCE!! !